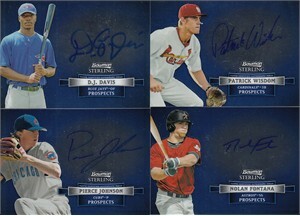 Lot of 4 different 2012 Bowman Sterling certified autograph cards: D.J. Davis, Nolan Fontana, Pierce Johnson and Patrick Wisdom. NrMt-Mt or better. ONLY ONE LOT AVAILABLE FOR SALE.